With all the added expenses that come with the festive season, thoughtful homemade gifts could just be the money-saving solution you need! 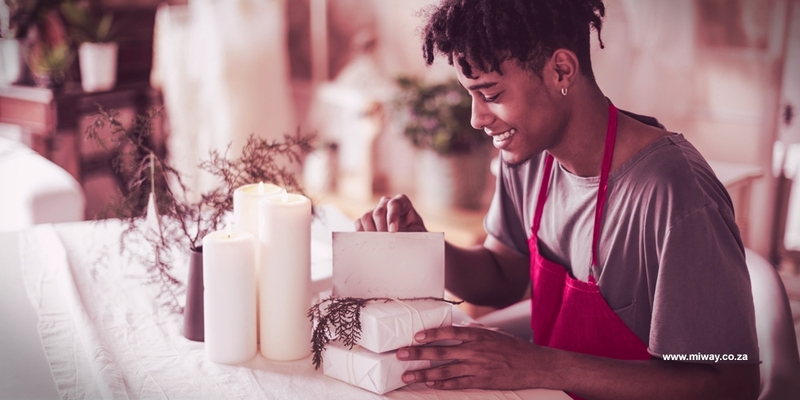 Who knows – if your gifts turn out really well, and you enjoy making them – you may even want to consider starting a small business! We’ve done the research for you. Here are 5 quick and easy do-it-yourself gifts that you and your family can make together. The cliché “the way to their heart is through their stomach” rings true! Biscuits in festive shapes, your famous brownies (just like granny made them) or even treats for furry friends will always go down well (pun intended!). Wrap empty (clean!) Pringles containers in pretty paper and fill them with your freshly baked treats to make an impact. If you’ve never heard of this, stovetop potpourri is a simple way of adding a heavenly scent to the air in your home. The idea is to add dry ingredients to 3 cups of water and keep it simmering on the stove. To create a kit, fill a glass container with ingredients like cinnamon sticks, dried citrus peel and star anise – anything you think smells nice. Don’t forget to tie a pretty ribbon around the container and attach a tag with instructions! Print out a colour photo (or your favourite quote) using a laser printer and stick a piece of packing tape over the image. Remember that the image should be small enough to be completely covered by the tape. Cut it out to fit onto the glass of a cylinder candle. Submerge the photo and tape in water for a while until the paper comes off the tape. Remove the remaining paper fibres carefully and let the photo and tape air dry. When it’s completely dry, the tape will be sticky again - smooth it down on the glass of the candle for a lovely personalised gift! A peppermint foot soak kit. Wood burning (pyrography) craft items. Wood burning is a great way to personalise gifts like chopping boards or wooden cooking utensils. Why not make it really special by recreating a child’s drawing on a wooden board – even a special quote or inside joke you share with the recipient? Simply copy the design/drawing onto a clean wooden surface by using carbon paper. You can then use a woodburning pen (available at hardware stores) to burn the design onto the wood. If you do decide to go the entrepreneur route, don’t forget about purchasing the right business insurance to protect your stock or specialised equipment.